More safety and comfort for your customers with our Smart Home software. 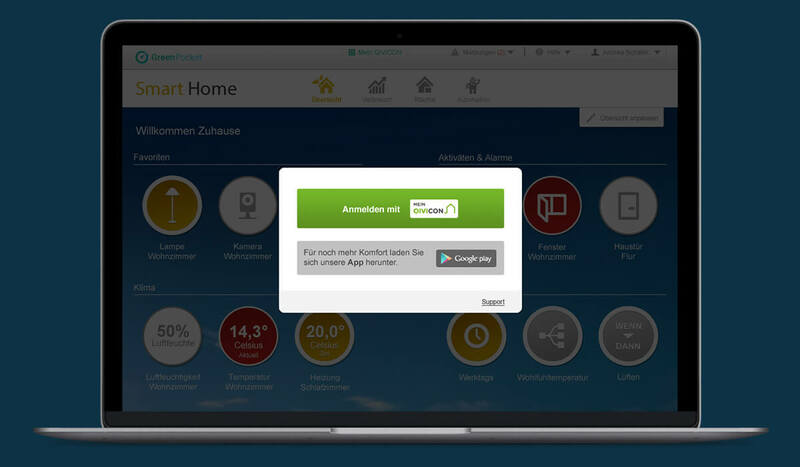 As a front-end partner, GreenPocket offers you intuitive Smart Home white label applications that combine energy saving, security and well-being in one app. 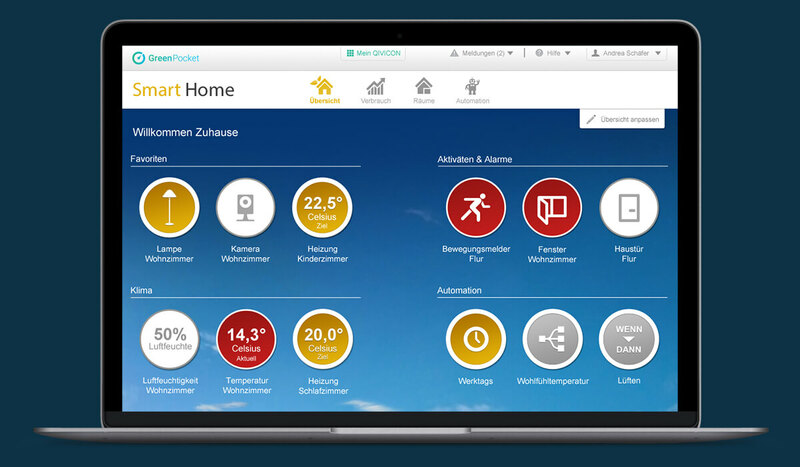 On Deutsche Telekom's Smart Home backend platform (QIVICON Home Base), we were already able to establish the first certified Smart Home app in 2011 and have since worked together with four major utilities and municipal utilities to continuously develop our solution. The targeted combination of smart metering and Smart Home enables a variety of user-oriented application scenarios. By linking the awareness of the potential for savings in-house with Smart Home control, the consumer can improve his energy efficiency in the long term in order to protect the environment and reduce his energy costs. Intelligent software and high-quality hardware components, such as detectors and sensors, make the home intuitive and easy to control. Schedules, rules and scenarios enable automatic control of individual device groups and rooms. By nesting different types of commands, even complex use cases can be implemented. Predefined consumption patterns help the user to configure his home optimally. Individual changes can be made quick and easy via an intuitive user interface. Our Smart Home solution is based on the multi-compatibility and systemic openness of the GreenPocket solution, which has been successfully proven in numerous projects. The most important transmission standards (e.g. Zigbee, Z-Wave, HomeMatic) are supported by our Smart Home solution and thus enable an effortless and hardware-independent integration of the QIVICON Home Base. Thanks to intelligent automations and colour light control, your customers have more time for the important things in their everyday life. Our Smart Assistants support you in creating automations, for example by creating predefined rules. The Smart Home helps to optimize heat and energy consumption, thereby saving costs and protecting the environment. Thanks to individual alarms and notifications in combination with smoke detectors and IP cameras, your customers always have the good feeling of living in a safe home. With video surveillance and warning notifications, your customers feel safe and secure at all times, even when they are old. 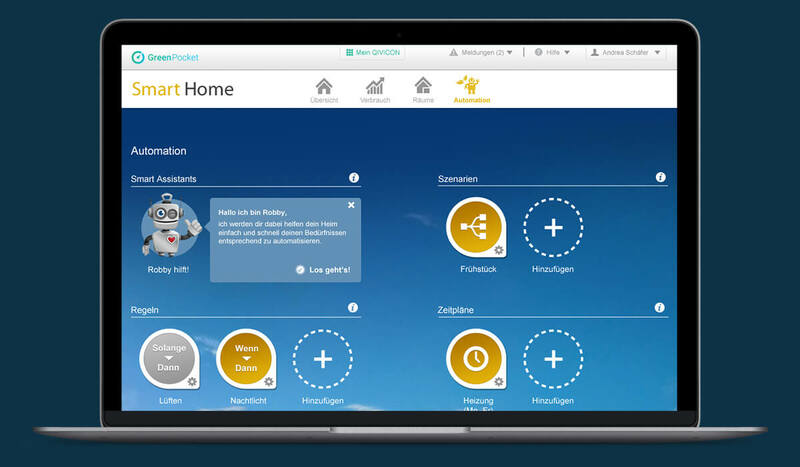 Our how-to video shows you the possibilities, advantages and added values of the Smart Home Software. Request product brochure for further information.